Looking back on my travels there are a few particularly epic journeys which have imprinted themselves on my memory. The trek to Lanquin, Guatemala to see the sacred waters of Semuc Champey is one of my favourites. I know for an absolute fact that the river boat from Rio Dulce, seven-hour bus journey and final jungle stumble the back of a truck in the rain into a hastily booked hammock would have been much easier if I’d been carrying the amazing piece of kit that is the Kosan Travel Bag. The type of travel I love rarely involves a direct route. Exploring, adventure and immersing myself in a new culture is key and that takes tiny planes, muddy mountain bikes, rickety land rovers and lots of leg work. 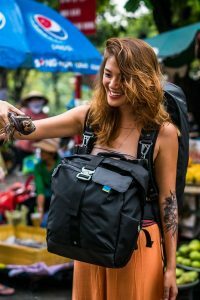 The Kosan Travel bag makes day to day life on the trail so much easier, it was thoughtfully designed by actual backpackers and world wanderers and you can tell! 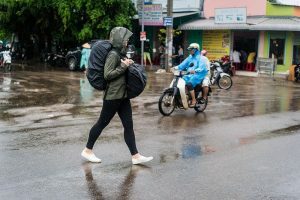 We’ve all seen it before, travellers slinging two big backpacks with one on the front, and the other on the back…it’s awkward, extremely uncomfortable and difficult to use. And we thought, it’s time to find a better way. 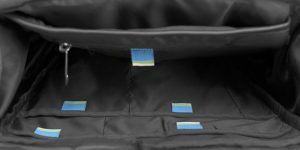 Kosan have developed a durable, extremely water-resistant, secure and comfortable piece of luggage that is actually an ingenious system of two bags which can be carried five ways. The flexibility, clever, safe storage and reliability of the Kosan Travel Bag would have been super useful on all of my trips. My exploration of Nepal fell during monsoon season and involved an exhilarating descent of a spectacular waterfall in Lwang Ghalel. Camera equipment, my phone and dry clothes are precious and there was always the niggling worry that my current rucksack would let me down with a leak. Monsoon rains or an accidental dip in the river would have been disastrous, the rain covers are a dream for for this! The wonderful people at Kosan aren’t designers they are engineers! Each problem their collective travels have presented them with has been brainstormed and fixed by this bag. My personal nemesis is keeping track of all the fiddly bits and pieces needed for a nomadic life. Camera batteries, coin purses, hand sanitiser, blister plasters and such like are so easily lost in traditional kit bags. It drives me crazy searching for what I need. The internal storage system inside the Kosan Travel Bag is perfect for me… it’s as though I designed it myself. Madagascar is beautiful and it was an unforgettable trip. I travelled by boat on the Tsiribhina River, traversed Via Ferrata in Tsingy de Bemaraha Park and went on safari in the stunning Kirindy Forest. Having a bag, in fact two bags if I needed, that adapted to each of these wonderful experiences would have been awesome. 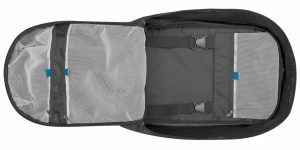 A lightweight, lockable, smaller bag for climbing with, a water-resistant bigger bag with the smaller bag attached with a hands-free harness for a longer trip taking pictures of crocodiles on the river and a sturdy, duffel bag to sling over my shoulder while hopping into a 4×4 to speed off and catch a glimpse of the wildlife on safari. Kosan believe so resolutely in the quality of what they sell that their travel bags come with a lifetime guarantee. The founders know how hard their product needs to work to become a loyal travel companion so this promise of longevity is much, much more than a marketing ploy. I’m excited to take my useful and stylish new best friend on the next adventure. I’ve got a feeling that this is the start of a beautiful relationship. 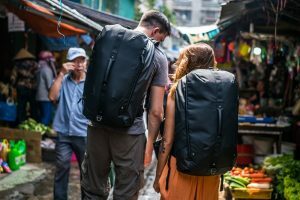 How do you bag your Kosan Travel Pack? The Kosan Travel Pack started as a Kickstarter campaign and I’m delighted to say they have now surpassed their goal so the project is 100% go! The bags will be ready in Spring 2018, not long to wait for the perfect travelling solution! There are still some early bird rewards available at 30% off so no time to waste, click this link >> Kosan Travel Bag. This is an affiliate link and I would therefore gain a small commission for introducing you to Kosan Travel Pack – there is no additional cost to yourself. 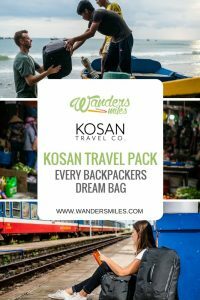 I hope you enjoy your Kosan Travel Pack and believe in it as much as me!